The announced withdrawal of South Africa from the ICC, along with several other African states, has sparked a wide debate on the role and limitations of the Court. It has elicited a renewed focus on global governance institutions, including concerns over the limits and scope of such institutions. This roundtable discussion assembles four eminent scholars to take stock of the arguments surrounding the status of the ICC and explores possible directions for its future. Discussion will touch on the perceived anti-African bias of the Court, its continued relevance on the continent and possible options for its renewal to strengthen global justice and the rule of law. Barney Pityana is Professor emeritus of Law at the University of South Africa (Unisa). He is the retired Principal and Vice Chancellor of Unisa (2001-2010). He was member and Chairperson of the South African Human Rights Commission (1995-2001), and a member of the African Commission on Human and Peoples’ Rights (1997-2003). He is an Attorney of the High Court of South Africa. Henning Melber is Extraordinary Professor at the Department of Political Sciences at the University of Pretoria and the Centre for Africa Studies/University of the Free State in Bloemfontein. He is also Director Emeritus and Senior Advisor of the Dag Hammarskjöld Foundation and Senior Research Associate with The Nordic Africa Institute, Sweden. Siphamandla Zondi is a Professor at the Department of Political Sciences at the University of Pretoria. Until recently, he spent 11 years working at the Institute for Global Dialogue, a prominent international affairs think tank. Before that, he served as a researcher on southern Africa and liberation movements at the Africa Institute of Africa. Dire Tladi is a Professor of International Law at the University of Pretoria. He is also a Member of UN International Law Commission and Special Advisor to the Minister of International Relations. Her formerly served as Legal Counsellor of the SA Permanent Mission to the UN. 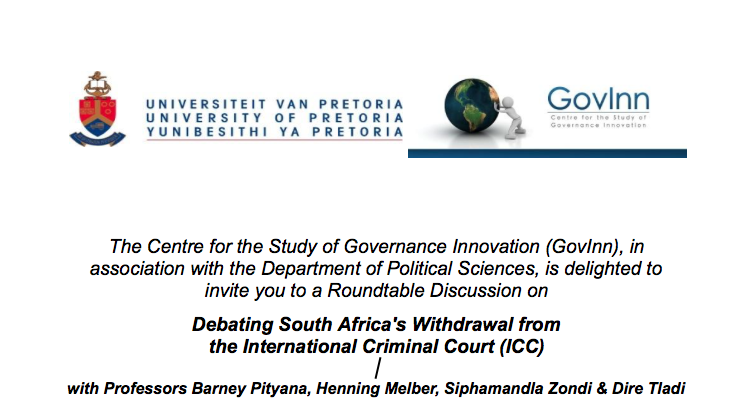 The roundtable will be moderated by GovInn Director, Prof Lorenzo Fioramonti. RSVP essential: https://goo.gl/forms/QeH79BHjHAHOMEig2 by 07 December 2016.